Hi, folks. It's been an incredible year so far, and it's only looking to get better. I've got a big announcement for you. 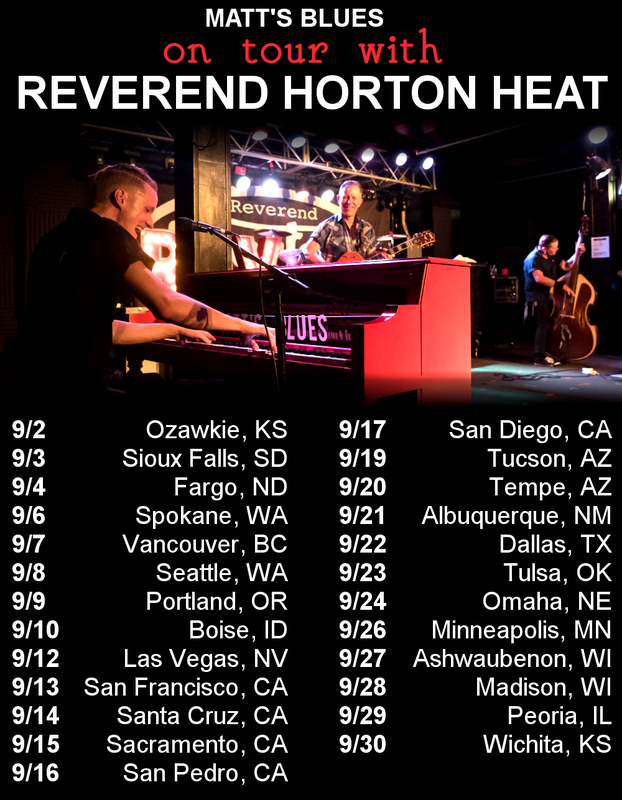 Starting September 2nd, I will be on a national tour with the Reverend Horton Heat! Our first show is THIS SATURDAY in Ozawkie, KS. Check out our tour dates below and follow my page on Facebook for constant updates Here. Come out and see us! This show is sure to get you fired up! That's not all that's happened recently. It's been a busy year! After that I headed off to do a few shows with the infamous Lucky Tubb, first in Savanna, IL and then Tucumcari, NM. I've seen way more of this beautiful country than I expected to in just a few short months! Did some sightseeing, too. If you squint, you can see part of Cadillac Ranch in the background. Look it up - it's pretty wild. If you have an old piano you need tuned, serviced, or restored, let me know! When I'm not on tour that's my favorite pastime. I can paint it any color you want, too. Not all of them end up purple! That's it for now. I'd like to say how thankful I am to have fans like you who read this page. Your support goes a long way. Don't forget to like and share my Facebook page, and I hope to see you this month on the road!